The Infinity Falls river rapids attraction is set to open this summer at SeaWorld in Orlando. The ride features 15 custom 8-passenger rafts, designed to let riders sit face-to-face to enjoy the exciting thrill ride together. While on the raft, riders will experience an adventure through rainforests inspired by some of the world’s most spectacular freshwater ecosystems. An innovative vertical lift element hoists the rafts to the top of the ride, where riders will get to experience an exhilarating and record-breaking 40-foot drop down to the bottom of the ravine. Infinity Falls is SeaWorld’s first attraction that will share the message of water conservation as part of its “Park to Planet” mission. Their goal is to help guests understand some of the various challenges facing the planet, and encourage them to want to help. While SeaWorld has always been a significant advocate for the preservation of the world’s oceans, they are now trying to bring awareness to the importance of the streams and rivers leading into the oceans as well. After riding Infinity Falls, guests can check out the village and partake in interactive experiences that integrate play with learning. 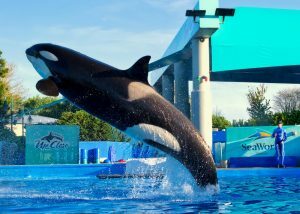 SeaWorld hopes to inspire young guests to become scientists one day by seeing how fun and cool it is. It also hopes to instill the passion to young guests to help save the planet today and in the future. If you are visiting Orlando this summer to be one of the first people to check out Infinity Falls as well as the many other newly opened attractions, you’ll need a comfortable place to stay. The Rosen Inn International is located minutes from all of the famous theme parks, allowing you to experience all of the fun and excitement Central Florida has to offer. Call to reserve your room today: 407-996-1600.